Have you spotted Winsulation in Queensland Homes Magazine this month? If not, make sure to grab the latest issue which hits newsstands on 19 April. Queensland Homes is one of Australia’s leading home renovation and home decor magazines. In this year’s Autumn/Winter edition, you’ll find a beautiful feature on Grace on Main – a project that Winsulation completed in 2017. Grace on Main is a designer home located in the inner-city suburb of Balmoral. The property was designed by AKA Architects and is situated on a hillside with incredible views over Brisbane city. The home includes four levels, each with customised high performance double glazed windows and doors, designed and installed by Winsulation. The windows and doors total over 300 square meters with a combination of fixed and awning windows. It features the Savio in-out handle system and electric actuators, sliding windows, raked windows, oversized height stacking doors and tilt and turn doors. We used a variety of glass combinations to achieve a six-star solar rating, therefore creating an insulated and energy efficient home. 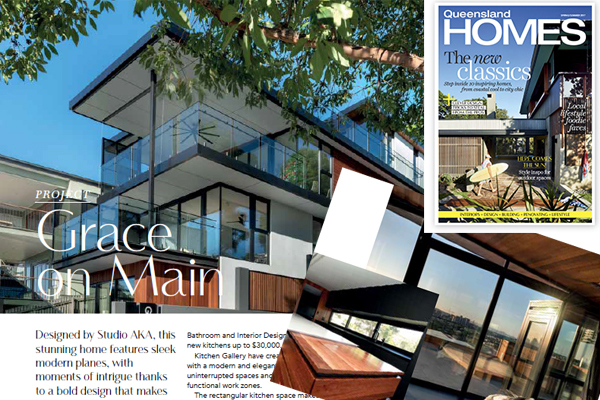 The feature in Queensland Homes magazine includes partners AKA Architects, Kitchen Gallery and Lumad lighting.